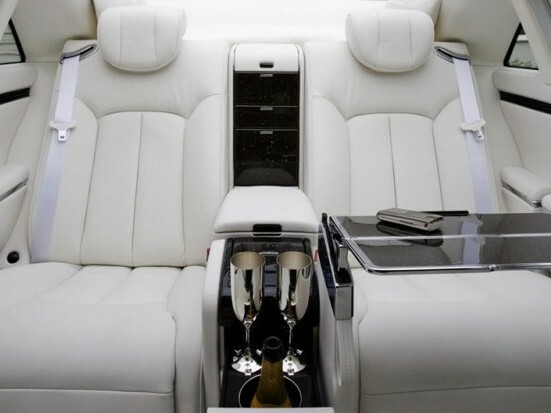 Executive Rear Seats or rear comfort seating can be found on full size luxury vehicles where the rear seat is designed to enhance chauffeur intended transportation. Flagships are perfectly suited for executive transport so most full size luxury sedans offer rear comfort seats but they may also be found in large SUVs. It starts with changing a three seater rear seat into two seats separated by a fixed center console. The rear seats now have the flexibility and comfortable seating of luxury front seats. Although the seats only accommodate two persons, the rear space should be large enough for three adults so the separate rear seats in a coupe are not considered to be executive rear seats. Executive Rear Seats are almost always offered in an extended wheelbase vehicle. The space provided by extra length adds to the space, comfort and the ability to have further seat adjustments. The seats are always first class with individual power and memory function. They may also be heated, cooled, ventilated, multi contour and massaging. Some vehicles go a step further as the person seated behind the front passenger seat can recline their seat to an almost fully horizontal state while simultaneously sending the front seat forward. Occupants in these seats also have their own controls for the infotainment system. These infotainment buttons are placed on the rear center console. The rear infotainment is displayed on the rear seat entertainment screens. There are also some other luxury features that may contribute to executive seating such as rear sunshades, a mini fridge or cool box and fold out tables that are used to create a workspace. There is a vehicle where executive rear seats are standard. The long (S62) and short (S57) versions of the Maybach limousine are equipped with one of the most luxurious rear sets money can buy. Hyundai offers executive rear seating in their Equus as a trim level. The one size Equus offers executive seats in the Ultimate trim and regular, but still comfortable seats in the Signature trim. Some of the well known names for Executive Rear Seats are executive class seating by Lexus and rear comfort seating by Mercedes Benz.